Tommy C. Upshaw, 60, passed away on October 3, 2018. He attended school in the Walker County School System. 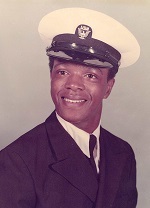 He was a veteran in the United States Navy. He was preceded in death by his parents, Bessie and Lewis Upshaw; grandparents, Addie and Willie Turner, Patterson and Emma Upshaw; sister, Connie Upshaw. Survivors include his brothers, Stanley and Glenn Upshaw; nieces, Elizabeth (Stacy) Stamper, Martina (Gerald) Harris, Erica (Michael) Smith; nephew, Nicholas Wesley; aunts, Carolyn Mathis, Minnie Turner, Blanche Turner; uncles, Hewitt Turner, William (Joyce) Turner, and Sherman (Peggy) Turner; dear friend, Janie Strickland; a host of other relatives and friends. The body will lie in state after noon on Thursday, Oct. 11, with visitation from 6–7 pm. at the funeral home. A funeral service will be held at 1 p.m. on Friday, Oct. 12, in the funeral home chapel with Bishop Kevin Adams officiating. Interment will be in Chattanooga National Cemetery.